Last week I set off on a motorcycle vacation. 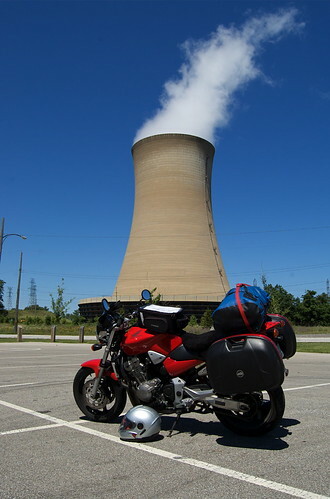 The plan was to ride to Kalamazoo, MI, to meet up with a riding buddy who had moved away. 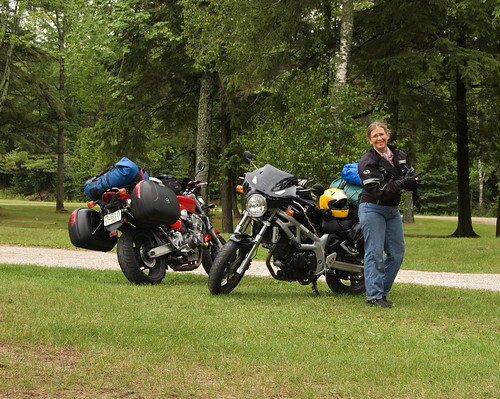 I was free earlier than Reena so the I was to meet Devon on Friday and the two of us would ride up to meet Reena on Sunday in Escanaba, in Michigan's Upper Peninsula. Leaving Madison at 7:15 or so on Friday morning put me in Chicago - near Ohare airport - at 9:50 AM. Pretty good timing for getting through Chicago except that this was the start of a holiday weekend. I did not know what to expect traffic-wise. Shockingly, I breezed through Shicago and found myself on the Skyway bridge entering Indiana only 30 minutes later at 10:20! Since I had allowed myself so much time, and Devon was not expecting me until late afternoon, I got off the expressway just past Gary, IN, and took a more scenic, and slow, route up along the Eastern shore of Lake Michigan. My first photo op was in Michigan City (ironically located in Indiana). I putted up the lake until around 2:00 then turned the bike east and a bit south to head for Kalamazoo. I arrived to find Devon's two children quite sick. Hmmm, thought I, not a great place to be at the start of a vacation. I better not get sick! Over the course of the evening it became abundantly clear that Devon was also sick and getting worse by the minute. He put himself to bed early knowing full well that he would not be departing with me in the morning. On the other hand, I had a fine evening chatting with his wife, a one-to-one conversation that likely would not have occurred any other way. On Saturday morning I opted to ride, solo, up along the Lake Huron shoreline. I was pretty disappointed because one seldom sees the lake. Michigan has allowed construction of homes between the highway and the lake. I didn't get any really good photos until I was up by the Mackinac Bridge. 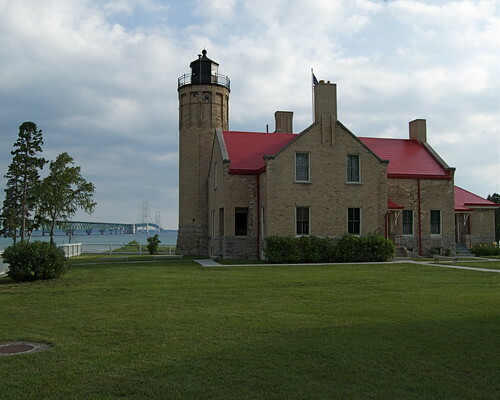 In addition to a seriously long suspension bridge, there is an old fort and a lighthouse there. I camped in the general area. That was not my original plan ... 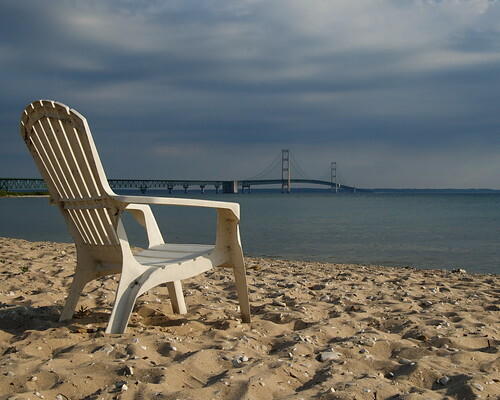 I had to drive many miles further than anticipated because there are few campgrounds in that part of Michigan. Who knew? Sunday morning I crossed the bridge and followed scenic Hwy 2 west to Escanaba along the northern shore of Lake Michigan. Rendezvousing with Reena was achieved without a hitch. Hi there, are the Reena and Devon that you are talking of from Niagara Falls? I Read that that had a bad experience with PaMar Renovations. I would like to get in contact with them because I too have had problems with the company and I am taking them to small claims court. You can reach me at (289)686-8090. Thank you in advance.